The severe weather has moved to our east. If any pop up storms come our way that include lightning we will seek shelter inside Memorial High School until the weather clears. In case of SEVERE WEATHER that is known before a session begins, we may cancel. Many of you have long drives to attend. Please don't hesitate to text to confirm a session will run or not. the 3 athletes that collected 5 STATE CHAMPIONSHIPS! See all 24 Madison throws Club Throwers that have won State Championships HERE. 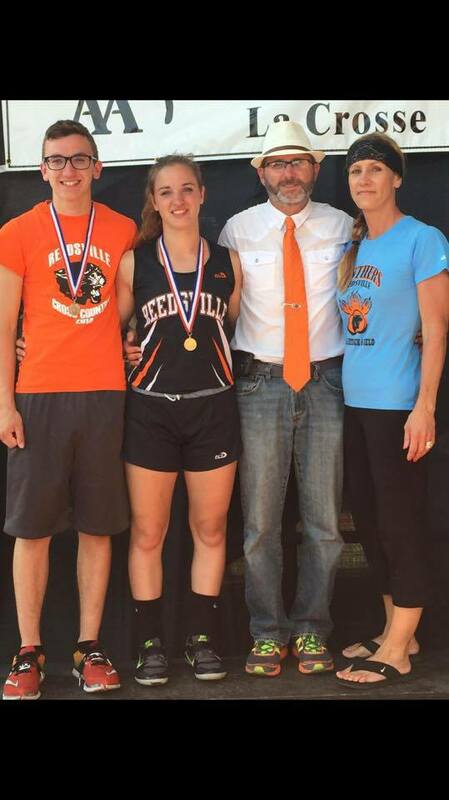 Chloe Eckstein, (sr.) Reedsville for winning the 2015 D3 Girls WIAA State Discus Championship. Chloe finished on the podium at the 2014 State Meet. Her throw of 125'5" earned her GOLD and put her at the top of the podium in her final high school meet. Congratulations Chloe! Best of luck at Concordia University next year! Belmont's Tucker Wedig (sr.) had a target on his back as the defending State Champion in the Shot Put and Discus. The pressure did not get to him in either event. As he stepped into the discus ring on his final throw still needing a throw to put him over the top, Tucker found what he needed - the winning throw 164'11". A day later, Tucker Completed the back to back sweep in the Shot Put by throwing 57' 00.5". Congrats Tucker, best of luck next year at the University of Wisconsin! Sam Noennig, (jr.) Hartford, came into the 2015 State Meet as the defending champion in the Discus, however, because of the remarkable season of Josie Schaeffer, (so.) Baraboo, Noennig came in as the 2nd seed. Sam and Josie finished the preliminaries tied at 155'1". Sam wasted no time to hit a big throw, going 161'6" on her first throw in finals. 161'6" is a new P.R. for Sam and is the 6th best throw in Wisconsin Prep History. It stood up to win amongst a barrage of quality throws from Schaeffer. I'm sure the 2 will be back at it next year as well as several others from a strong field of underclassaman including Karly Murphy - River Falls, and Holly Houston - Madison Memorial. Sam Noennig, also won the D1 Shot Put on Saturday. Besting a deep field of underclassmen who will all return. She will look to build on her State Championship throw of 44'5.5" next year.